As I was out this morning, I passed a “Salvation Army” truck, and I was reminded that when I was little, about this time every year, we’d go through our toys and donate those we no longer played with to the Salvation Army. I don’t ever remember asking why we had to give our toys away; we just knew we did. We understood the reality that there were other little boys and girls who didn’t have toys and we had enough to share. That was reason enough. I don’t ever recall fussing about it, though my mom might recall things differently. We didn’t have tons of toys, but we were never, ever without something to play with. I played with my brother’s guns… and well, I won’t say he played with my dolls, because I don’t ever recall him playing with them, but I played with his GI-Joe tank! And, I never had a baseball glove of my own, but when all the kids in the neighborhood played baseball, there were always plenty of bats, gloves and balls. And, we all had bikes (with baseball cards clipped to the spokes). What does ‘generously’ really mean? I looked it up: abundant, magnanimous, bountiful, not selfish. It’s easier to not be selfish with ‘things’ than it is with my life. Am I willing to give away time? Am I willing to give up half an hour to chat with a friend who’s hurting? Am I willing to babysit in the church nursery and give up time with my family? Am I willing to lead a Bible study and give up my TV time in the evening? Am I willing to give up a child, or grandchild to the mission field? Am I willing to give up vacation to serve on the mission field? I also looked up magnanimous: generous in forgiving! I never really thought about giving forgiveness as a gift. I have plenty of forgiveness, I won’t ever run out. God always forgives me when I confess my sin, but am I willing to be generous with my forgiveness? Or do I hold onto it tightly? What has the Lord put on your heart to give this time of year? Is it time to clean out the toy box? Garage? Storage room? Your closet? Your heart? 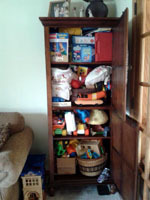 I’m going to go through this toy cabinet; the grandsons probably won’t notice! And, I’m also going to search my heart and get rid of any unforgiveness that’s hiding there.